And it’s a very little crown indeed, since these flowers are only about 3/8″ across. There were more blue ones than I’ve ever seen at Brazoria last weekend, but there always has been a mix of colors there. Even when it seems only the orange ones are around, there usually are at least a few of the blue. soil minerals may play a role in colors? They do, but probably not in this instance. The blue and red can be snuggled right up next to one another. What is life without mystery to ponder? Did not know that they could be blue! Always smile when I hear Scarlet Pimpernel because of an old Daffy Duck cartoon. That is a funny bit. Did you happen to notice that after Daffy changed into his superhero costume, his tunic was blue? He is just behaving like the scarlet pimpernel (or pumpernickel!) that he is! I like to think some artist knew a bit of botany and was having a little extra fun. Beautiful macros of this versatile flower. The red version is stunning and the story behind the blue one most interesting. Klausbernd is the “colour person”, collecting and saving anything new about colours and its behaviour so I’ll wish you a happy weekend and pass you on to KB. Stay warm! I sometimes find white versions of blue, lavender, or pink flowers, and while I’ve understood how they can multiply and begin to form small colonies, I’ve never been sure why the white ones appear in the first place. Now, I have an idea, and a place to begin learning a bit more. These are among the most vibrant I’ve seen. Even though I found them on a cloudy day, the blue was stunning, and certainly caught my eye from some distance away. I didn’t saturate the colors at all in post-processing. There was no need. Oh dear, I am not a specialist for the chemistry of colours in plants. 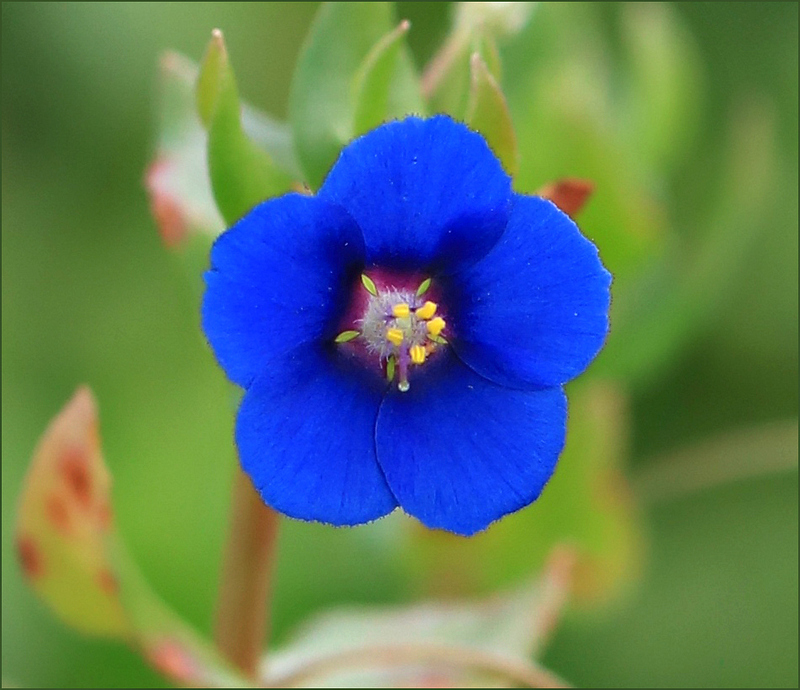 But I suppose the scarlet or blue of the Pimpernel has to do with the amount of light it gets. In the photosynthesis that will be changed into chemicals (I think sugars). Their amount might determine the colour. Plants react with colour against frost at night (with a certain red) f.e. Seen from the colour circle scarlet and blue are not that far from each other. Both are cold colours. Seen from colour theory the difference between these colours is not significant. My educated guess: It all has to do with the light the plant uses for photosynthesis. Sorry, but I was studying different colour and perception theories and the language of colour. If I looked at plants, I was interested in which pigments are delivered by which plant. How this all happens chemically is beyond me, but it was interesting to learn that the same malvidin that results in these blue flowers also is responsible for the color of blueberries, and the pelargonidin that gives us the scarlet pimpernel can be found raspberries and strawberries, red radishes, and kidney beans! Thank you very much, that gives a rough idea how to explain these different colours. I don’t know enough about biochemistry (I didn’t like chemistry at school) to really understand this. Another reader contributed this link about the reasons for purple cauliflower. it’s amazing, really. I’d not heard of anthocyanins until about two days ago, but in the case of the cauliflower, it’s the combination of their presence and sunlight that causes the color change. More proof for your point! I’m with RedTreeTimes, I cannot hear “Pimpernel” without an unbreakable chain: Daffy Duck, then try to do his wicked bad lisp, and then wanting pumpernickel (which I love), then Baroness What’s-her-name, and who the heck was she, anyway (thanks for the link!). This morning I heard “The Sorcerer’s Apprentice” on the radio, and again, it’s gotta be Mickey Mouse. By following a link in Linda’s linked article I learned that Baroness Orczy had the ever so slightly longer name Baroness Emma Magdolna Rozália Mária Jozefa Borbála “Emmuska” Orczy de Orci. I also followed your Daffy Duck suggestion. The length of your reply stands in inverse proportion to Orczy’s full name. Oh, my gosh! What an ending — “It was getting so you have to kill yourself to sell a story around here!” Totally unexpected, and completely hilarious! That’s quite a name. I didn’t realize that The Scarlet Pimpernel is part of a series. Emmuska kept herself busy. I laughed at the links in your memory chain. I just went through the same thing when you mentioned Mickey Mouse and The Sorcerer’s Apprentice: Mickey, Wizard, brooms and water buckets, stark terror. That movie left such an impression when I was a kid I can’t see a still from it without shivering. Now, I’m trying to remember what pumpernickel bread tastes like. I may have to get a loaf, just to satisfy my curiosity. The flowers are thick right now, and so vibrant. It may be that conditions were perfect for them, or it might just be that I happened upon the freshest batch I’ve ever seen. They were fun to photograph. Disney did a great job, I can see those marching brooms, too. Did you ever see that Italian version of Fantasia, called “Allegro Non Troppo”? It wasn’t quite the same thrill, but still a lot of fun. The Texas wildflowers are so beautiful. We’re green with envy, and boy that’s the only green around here for sure!! I missed “Allegro non Troppo.” When it came out, I still was in Liberia, and perhaps by the time I was back in the country and paying attention, it wasn’t getting the publicity. Or, it may just have been off my radar. We’re getting ready to swing into the spring season, for sure. This year the winter bedding plants did well, so we’re awash in pansies and snapdragons and such, but it still is fun to see the native plants starting to stir. Besides the interesting tidbit about the color variations, I understand these flowers only open when the sun is shining. I can appreciate that about them! I love the blue varieties; the orange, not so much. Outstanding photos to usher in February and make me long for spring! The name “poor man’s weatherglass” came from that tendency to close on cloudy days — a good indication that rain was on the way. Blue isn’t generally my favorite color, but this blue is impressive. I do like finding places where the orange and blue have combined. It’s like finding bluebonnets and Indian paintbrush together in a field. The whole truly is more than the sum of the parts. Interesting. I have had flowers that were planted in different locations and the color shades were different. There have to be a number of factors that play into color differences: sunlight, soil, the age of the plant, available moisture. Even genetics make a difference — pink and yellow gaillardia come to mind.Those sorts of things are really beyond me, except in the most general way, but I have noticed the kind of color differences you mention. I’ve not read the novel but seen the 1934 film several times. The movie’s male lead, Leslie Howard, died during World War II. I see the film’s on Amazon Prime. I’ll have to have a look. Of course, I’m one of “those” — for me, Leslie Howard will forever be Ashley Wilkes. I recognise the blue flower, and was admiring your skill in photographing such a small thing, not knowing it could be any colour other than blue! Guess that ties in with sunlight hours. Nice story with its name. It’s interesting to read some of people’s reactions. You thought it was typically blue, and yet Gary, in New York, thought it was typically orange. Here, I’ve always seen the two colors mixed together, at least in the sense that if I find one color, a little looking will reveal the other. They are tiny, but they have the advantage of being low to the ground, and rather well tucked into their leaves. There’s not so much blowing in the wind to contend with. There’s always something new to learn, Jeanie! I just learned today that Leslie Howard, who played Ashley Wilkes in GWTW, was the lead in the Scarlet Pimpernel film. Have you seen it? I found it on Amazon, and have it on my watch list, just for fun. And the flowers are beautiful — both colors. A lot of so-called blue flowers tend toward purple or lavender, but this is a real, true blue. Daffy takes me all the way back to the movies of yesteryear when a trip to the theater on Saturday afternoon included two feature movies, a news reel, an ongoing serial, and two cartoons— all for a quarter. Before video games, and before TV it was a great way to get rid of the kids for a whole afternoon. Daffy and Bugs were always favorites. 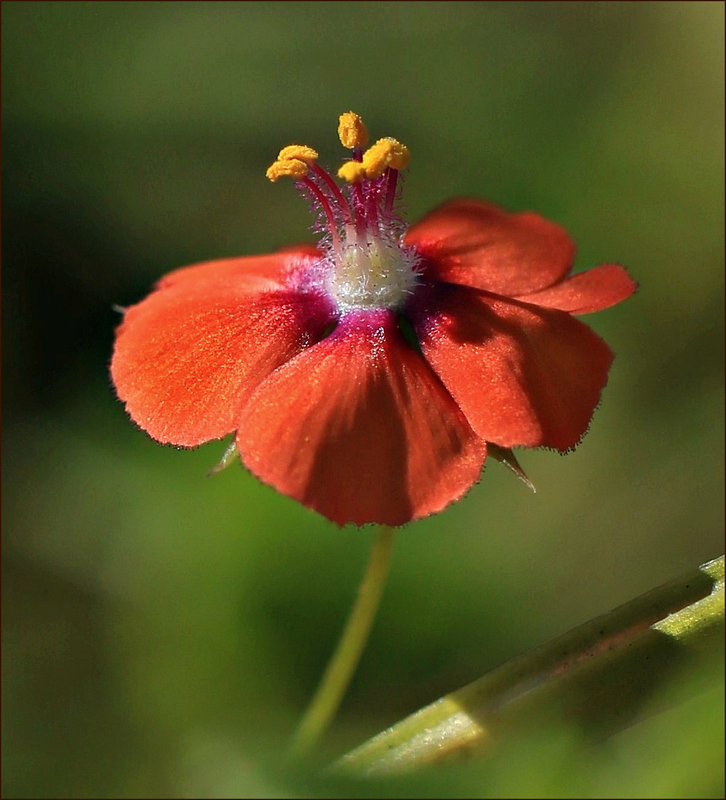 As for Scarlet pimpernel , it is an invasive plant in California. Looked up the scientific name and discovered that Anagallis means ‘amusing’ in Greek. Afternoons at the movie were great fun, and the offerings were the same for us. Those news reels were the best. I remember them being in black and white, and in my grade school years they still included some WWII footage. Scarlet pimpernel’s an introduced plant that’s in nearly every state in the U.S. It’s shown as absent or unreported in North Dakota and Wyoming, but I’ll bet it’s only unreported. Even though it’s introduced, it’s considered a common naturalized annual in California, and not an invasive. The terminology can be confusing, but I looked it up on the state site listing California’s invasives and plants of concern, and it’s not listed. I enjoyed going through the list. Texas and California share some invasives, while some plants that are native to Texas are considered invasive in California. So much complexity! Just wondering if the world of primary colours, and the resulting mixing of those, create all colours, are followed in the flower world. Theoretically, black is the absence of colour while white is the combination of all colour. Is that why black flowers do not exist? In any case, the above photos are wonderful. However, selective breeding can create really dark flowers that appear almost black. It’s been done with tulips, petunias, and other flowers. I suppose if someone wanted to take it on, a “black” pimpernel could be created, but it took sixteen years to create an almost-black hyacinth. I’m not sure someone would want to spend that kind of time with a flower that most gardeners call a weed! The flower world is as fascinating as the bird world. That opener photo made me gasp with delight. What is it about the blues? Isn’t that a clear, pure blue? It’s just gorgeous. I’ve seen the orange ones for years, but I used to be one of those who just stepped across tiny flowers and never gave them a second glance. My loss, to be sure. Now, I’m trying to make up for it. Aren’t we lucky that we don’t have to choose? Even though we’re not under piles of snow, it’s still in that in-between stage where everything is a little brown, a little dull, and these first flowers are a real treat. Oh, that blue! So rich and deep. Thanks for reminding me why blue is my favorite color. It’s one of the prettiest blues I’ve seen among the flowers. I can’t remember another flower, except the bluebonnet, that manages this dark, pure blue. Even blue curls or blue-eyed grass don’t quite make it, and so many flowers that get categorized as blue look lilac, or purple, or lavender to me. It’s good to have this one as a comparison. Her post made me curious about the appearance of the flower in her neighborhood. She described it as being “about the size of a dime,” A dime is twice the size of the pimpernels I’ve seen, and larger than the descriptions in any of my books. I suppose I’m nit-picking, since she clearly was looking for a comparison that would be familiar to most people, but she could have said “half the size of a dime” — unless she did find much larger flowers. I laughed at the thought of The Salmon Pimpernel. That certainly wouldn’t have had the same resonance. I have seen some flowers that could be described as scarlet, but they’re certainly not as common as the lighter shades. Maybe this will be the year to find a truly scarlet pimpernel, since I’ve never seen blue ones that are as vibrant as the ones I recently found. A few weeks ago, an agronomist friend gave me a cauliflower from her garden. It was tinged with purple. I asked her if it was a new variety or some variation of the purple cauliflowers I occasionally see in the supermarket. She said, “No, the purple comes from anthocyanin. It is produced when the cauliflower gets too much exposure to sunshine.” “Oh, ” said I. I ate the cauliflower. It was delicious. And I thought no more about it until your post today, which prompted me to return to the story of the purple tinged cauliflower.https://www.gardeningknowhow.com/edible/vegetables/cauliflower/purple-tint-on-cauliflower.htm It seems cauliflowers can be red, too. Or blue-ish. Hmm, am now imagining a story featuring a hero named the Scarlet Cauliflower. Could be a friend of the Jolly Green Giant. It seems to me there’s a relationship between a little flower that can be either orange or blue, and the art of changing orange carrots to maroon — and the same anthocyanin that turns cauliflower purple is the key. Oh, I was most interested to learn about the origin of the maroon carrot. I also read that Leonard Pike, the developer, died last month. https://www.chron.com/news/houston-texas/houston/article/Leonard-Pike-renowned-for-developing-supersweet-13533557.php He also developed the super sweet onion which has been the official state vegetable of Texas since 1997. There’s no better onion than the 1015 — not even the Vidalia. I’m sure you must have read that the “1015” designation refers to the optimum date for planting. No I didn’t know that. Most interesting. Here’s a little blurb from Wikipedia: Anthocyanins are water-soluble vacuolar pigments that, depending on their pH, may appear red, purple, or blue. Food plants rich in anthocyanins include the blueberry, raspberry, black rice, and black soybean, among many others that are red, blue, purple, or black. Some of the colors of autumn leaves are derived from anthocyanins. Nature and science together make for fascinating learning. I did a little reading among the herbalists’ blogs, and I don’t believe I’d take even a nibble of the scarlet pimpernel. There were a few cautions about the sap causing dermatitis, too. It always surprises me that such sweet plants as poinsettias and buttercups are listed among plants that can cause trouble, but ‘pretty’ doesn’t guarantee ‘safe’. I have eaten a bit of borage and candied violets, but for the most part I leave well enough alone, except for yucca flowers. They’re great in salads, with eggs, fried, and so on. If you’re inclined, here’s a good recipe to experiment with. Mostly I am reluctant to experiment with plants I don’t know enough about anymore than I would try and cook a puffer fish. But, the roots of medicine (NPI) are in the botanical sciences for sure. The only flower I ever ate was a kind of orchid and other than as a pretty garnishment, I’d pass. I guess the roots of British who-done-its are in the botanicals too come to think of it. One should not mess with herbalists. I’m with you. My foraging is limited to local farmers’ markets, with occasional stops at you-pick-em farms, the fish market, and the local marine supply store whose owner sells eggs from her chickens. The only thing that might tempt me would be morel mushrooms, but I’ll not find them around here. There’s nothing better as a spring treat. The story of the Scarlet Pimpernel (the person) is a fun one. I think you’d enjoy the film. The flowers, of course, are equally delightful, and a wonderful sign of spring. Both are lovely. I grow Salvia coccinea, Tropical sage. My original passalong plant from who-knows-who, was red. Over the years, most of the seedlings have produced the white version, which is my favorite of the two colors. I have to say that the red ones I have are blooming beautifully this winter, as we haven’t had any sort of real freeze. I loved the book and have seen a couple versions of the movie. Fun! Isn’t it interesting to watch plants transform themselves? When I went to the Wildflower site to take a look at some images of your sage, I was surprised to see a photo of it producing a different kind of white bloom: frost flowers. I had no idea it would do that. That makes three I know of: frostweed, camphorweed, and sage. Another interesting tidbit: despite the fact that sources say these often are pollinated by flies, I’ve never seen an insect on one. Since they aren’t native, and since I usually find them in the vicinity of other native plants, I wonder if the insects are showing a preference for the natives? It could be a bit of support for concerns that have been expressed about exotic and highly cultivated plants not providing nutrition for our native pollinators. A connection? I think there just might be(e)! What a lovely flower and a memory from childhood of watching the original movie. I love vibrant color, and this flower does its part to keep the landscape interesting. It’s such a tiny thing — just about 3/8″ across — and yet it really catches the eye. Interesting article, reviving some of the plant biology 101 I took so many years ago. Colour polymorphism is present in birds too, generally related to diet, and especially the consumption (or lack thereof) of carotenoids. Some flamingos are markedly not pink! At present I am in Costa Rica and the sheer array of colour is captivating and the shape, size and form of inflorescence staggering. The heat is getting to me though (mid thirties every day, with 100% humidity) and I will be happy to get back to some snow and cold on Thursday. As you suggested to someone on your blog, coping with cold is made easier by the ability to layer on clothing. In the heat and humidity, there’s only so far a person can go in taking layers off. There are ways to cope in the heat, of course, but a strange analogue to end-of-winter cabin fever afflicts those of us who end up hiding in our homes around the end of August. I can only imagine your enjoyment of the flowers and birds. These two blooms certainly reminded me of vibrant tropical colors. As for the flamingos, we see the same phenomenon with our roseate spoonbills. They can range from almost-white with a tinge of pink to a deep, orange-y pink, and as you pointed out, that carotenoid-rich diet makes a difference. This is another example of a macro lens revealing interesting details that often are missed. The hint of magenta around the pistel and stamens in both the blue and the orange is especially fun. Here’s another detail I’m pondering. Descriptions say these flowers have five petals and five stamens. But look at that orange one. I swear I see six petals. Perhaps one has divided, or perhaps an extra was added along the way. See it sticking out on the right side? What do you think? Nature is cool, indeed. I don’t know enough about plants’ production of pigments, or the color wheel, to be able to even attempt a “compare and contrast,” but the colors just knocked me out. I’ve never seen such vibrant flowers on this plant. Aren’t they something? They certainly do perk up these end-of-winter days. Oooh, such beautiful blue tones. It reminds me of Sonoran blue, which I know as a greenhouse flower. And the orange pimpernel is lovely as well. Even though we don’t have your ice and snow, January and early February can become a little dull and drab. When the flowers begin to appear, their color always seems especially vibrant in comparison, but these were brighter than any I remember seeing. Very cheering! I’ve learned to love winter photography, but other than the sunsets and the icy blues, it’s a season of brown, black and white. Drab. For color this time of year, I head for a greenhouse. I love the images. I was trying to recall which images I have of flowers which display polymorphism. One of them was Ipomoea purpurea (a morning glory). Anyway, this post will motivate me to look them up. I remember also how unusual it is to find a perfectly blue flower, yet they are out there.